Rex the dad is an explorer who loves taking his family on adventures. Purrcilla is the energetic and wise mom. And Rory is the strong-willed daughter who loves helping her parents plan for the family's many adventures. 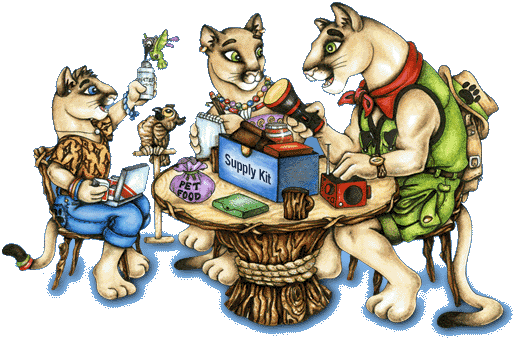 The site includes three one-page comics on aspects of preparedness, as well as games, coloring pages and other activities. Illustrations are by former Disney artist Betsy Baytos, who worked on The Rescuers, Pete's Dragon, The Fox and the Hound, Mickey's Christmas Carol and The Black Cauldron. Quoth the Glenn Beck: "SEE! I told you FEMA is trying to indoctrinate your children!" Wait, aren't these the same cougars Rob Corddry did an impression of on The Daily Show years ago? If their really looking for safety, they should come down to South Texas; Its so hot and dry here, nothing here ever wants to happen. Even that Tropical Storm Don didn't want to be here so it commented suicide before making landfall.